Vicki Zhao is Hua Mulan in Jingle Ma's Mulan. The Skinny: Director Jingle Ma's Mulan has decent acting and fine production values, but the story, dialogue and direction are little better than paint-by-numbers. Jingle Ma should stick to lighter fare, because when he tries for anything with stronger emotions he only seems to stumble. Aloys Chen sure knows how to cry. by Kozo: Jingle Ma's Mulan is a lot better than his previous Butterfly Lovers. However, relatively speaking that doesn't mean much. The latest screen adaptation of the story of Hua Mulan, cross-dressing warrior woman of Chinese folk legend, Mulan is an average costume epic for undemanding modern audiences. Vicky Zhao Wei plays the title role as an adult, with young Xu Jiao (who cross-dressed as a boy in CJ7) appearing in a brief flashback as the young Mulan. A strong-willed tomboy, Mulan excels at martial arts and doesn't hesitate for a second to stand in for her sick father (Yu Rong-Guang) when he's drafted into military service. She rises quickly up the ranks to general, eventually coming face to face with the burly Mengdu (Hu Jun), ruthless commander of the encroaching Rouran tribes. She also finds pure, possibly forbidden love with super-handsome soldier Wentai (Aloys Chen). No, the film doesn't have a little red dragon named Mushu. Unlike the enjoyable but understandably toned down Disney animation, Jingle Ma's Mulan has no talking animals and is a serious action drama about one woman making her way in a man's world. Or something. Actually, that's only one of the multitude of themes that Jingle Ma forces into his two-hour Mulan epic, and just like his filmography, there are hits and misses along the way. 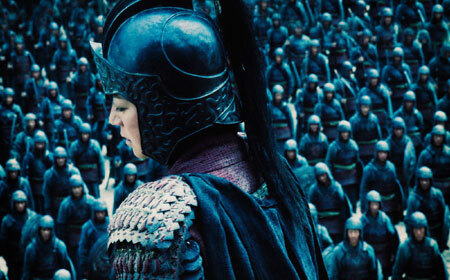 As a soldier, Mulan confronts the horrors of war, wrangles with military politics and experiences the difficulties of falling in love when she shouldn't. What she really doesn't go through is the whole "hide my gender" thing, because after the first twenty minutes it pretty much gets glossed over. Vicki Zhao's tomboyish image certainly helps her believability as Mulan, but as with his handling of Cheuk Ying-Toi in Butterfly Lovers, Ma doesn't seem that concerned with pretending that Mulan is really a he. Even if the whole cross-dressing thing were Ma's main point, it's doubtful that would have made the film better, as Ma's direction is frustratingly uninteresting. Ma has ample opportunities to engage the audience - the film's premise has multiple levels both narratively and thematically - but Ma hands each development to the audience through dialogue and very little onscreen discovery. The nadir of his unimaginative storytelling occurs when Mulan's childhood friend Tiger (Jaycee Chan) says to Wentai, "You two are so lonely," referencing Wentai and Mulan's inability to honestly connect. No offense to Tiger, but the best response here would be, "Duh". Jingle Ma should be using every other method at his disposal - actors, action, music - to tell us that Mulan and Wentai are lonely. Both Vicki Zhao and Aloys Chen turn in emotionally convincing performances, so that message gets across anyway. However, to ensure that everyone gets it, Ma throws that unnecessary, obvious line out there. Calling out a single line may be nitpicking, but Ma's choice of dialogue is symptomatic of the film's general malaise. Expected conflicts or questions are brushed aside in expository dialogue, with Ma's need to check off each plot twist seemingly more important than addressing the film's lingering questions or plot holes. For example, one character disappears and then reappears oddly, but outside of one or two people, nobody seems to notice or care. Mulan progresses inorganically, like it's so concerned with moving from point A to point B that it doesn't care to explore situations or characters properly. Anyway, there's no need for exploration, because the characters are too busy verbalizing how they feel. Many audiences may not care about this average storytelling because they've seen it in more hit films than would be humanly possible to count. Given its mediocre mass appeal, Mulan is able to pass the time in a familiar, inoffensive fashion. Generally, the film works, just not in a manner that one could ever term as superlative. The actors acquit themselves well, helping make up for the film's average status. Vicki Zhao is physically and emotionally fine as Mulan, and Aloys Chen is inordinately soulful as the super-cool Wentai. Chen should run his own clinic on how to cry on camera; his character tears up probably six or seven times during the course of the film, and while less would have been more, he sells his sniffling well. Jaycee Chan brings more to his character than probably existed on paper, and Hu Jun shows a fun charisma as the villain. In the "bewildering performances dictated by marketing" department, Russian popstar Vitas shows up as a singer held captive by the Rouran tribe. His presence makes for a somewhat amusing climax, which features some action, blood and a good 'ol serving of just desserts. Yes, the good guys do win, with the expected values - filial piety, righteousness, sacrificing for the greater good - all coming out on top. If you think those details count as a spoiler in a China film, you really need to get out more.